I would be delighted to read more about your alpacas. I think they should have a blog of their own. What fun that would be. Oh, Lisa – don’t encourage them! You’d be hearing from Daniel every day; next he’d be on Twitter and then want to sign up for Facebook. I don’t think that the world is ready for that. They *are* cute from a distance, aren’t they? I wish they were as cuddly as they look. 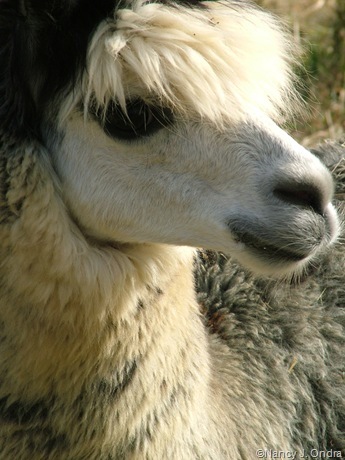 It was a bit disappointing to find that the people-friendly pacas that breeders take to public events aren’t necessarily representative of what the majority of alpacas are really like: interested in people and interactive in their own way, but *not* touchy-feely. And it’s such a shame, because they’re just the right size for hugging.